One question I noticed a lot of incoming graduate students had during this year’s Welcome Day was that if it’s possible to have a job while being in graduate school. The answer to this is yes. I have two! *laughs and cries* It’s not easy by any means: you must possess good time management and organization skills. It’s a little daunting at times and you will feel overwhelmed, but at the end of the day, my jobs are super rewarding in skills, experience, and connections. Like I mentioned above, I have two jobs on top of being a second year MFA Candidate in Photography at Columbia College Chicago. 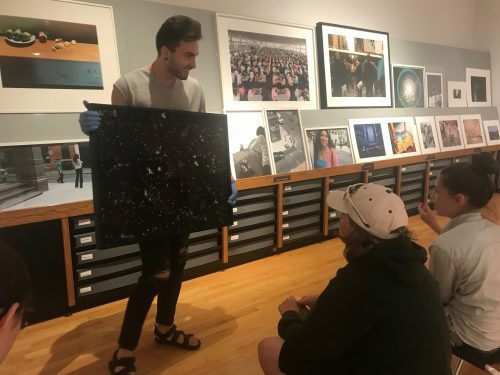 I work as a Graduate Ambassador as well as a Curatorial Assistant at The Museum of Contemporary Photography (MoCP), the largest solely photographic museum in the Midwest that is also connected to Columbia. The museum was founded in 1967, started collecting in 1969, and currently has over 15,000 art objects in its permanent collection. 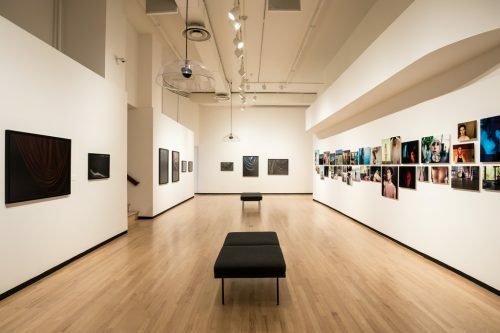 The museum also has a temporary, rotating curated collection called Midwestern Photographer’s Project (MPP) which features many faculty members and photographers who teach at Columbia. This collection features photographers and artists living and working in the Midwest. As an MFA Candidate in Photography, you have an opportunity to apply for a position here at the museum. Undergraduate students even get to work at the museum, which is amazing! There are many workers from different majors within the undergraduate program, which is great because they all bring unique experiences to the table, and I love all of their personalities. Since you can only work 20 hours a week on campus, I work a full 20 hours cause I gotta make that money. Work directly in the installation and de-installation of exhibitions throughout the museum. You also work closely with the head of operations during this time. Lead tours of current exhibitions for students, faculty, and the public all while engaging with them through discussion and questions about the work. Lead print viewings for classes at Columbia about many different photographic subjects, including but not limited to: Portraiture, Representation, Breaking the Binary: Queerness and the Image, Color, Alternative Methods, The Constructed Image, Foundations I / II, etc. In a way, this is great for teaching experience and it’s a great source for you to learn about different modes of photography. Work directly with curators at the museum on their upcoming shows. This means researching artists for them, contextual information for grants, memorizing floor-plan information for installation planning, etc. You will also get in contact with the artists directly during this time, which is great for learning communication skills. Learn the ropes on condition reports and accession reports. Work on and sit in on monthly portfolio review meetings, which builds curatorial experience and insight. Work with Adobe software, Sketchup, and other softwares on the regular so that you can strengthen your knowledge. During my fist year, I got to work on probably my favorite show so far, only because of the context on which the show was about: queer and trans identity and representation. “Disruptive Perspectives” was the first show I was able to completely install and de-install, as well as lead tours and discussions on it. It was a lot of fun, and all of the artists in the show influenced my personal work one way or another. Installation view of “Disruptive Perspectives,” left/center: Lorenzo Triburgo’s Policing Gender, Right: Zackary Drucker & Rhys Ernst’s Relationship. Image Courtesy of Jonathan Castillo, MFA Candidate in Photography, 2nd year. The image above features the view of the museum when your first walk into the space. A timeline sort of presentation: on the right, you will see the work Relationship by Drucker and Ernst, which this edit featured I think close to fifty images in no particular order. This was one of my favorite pieces to talk about because of the quantity and quality of the images. Zackary Drucker was also a visiting artist; she gave a brilliant lecture and then had studio critiques with us during our seminar. 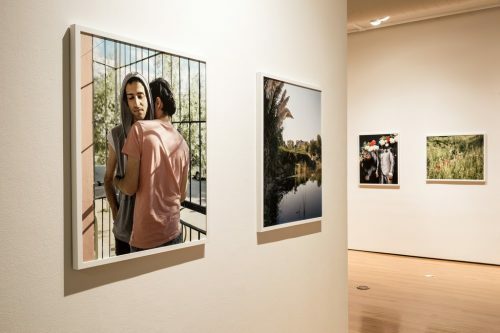 Installation view of “Disruptive Perspectives,” images from Lawrenece Rasti’s There Are No Homosexuals in Iran. Image Courtesy of Jonathan Castillo, MFA Candidate in Photography, 2nd year. 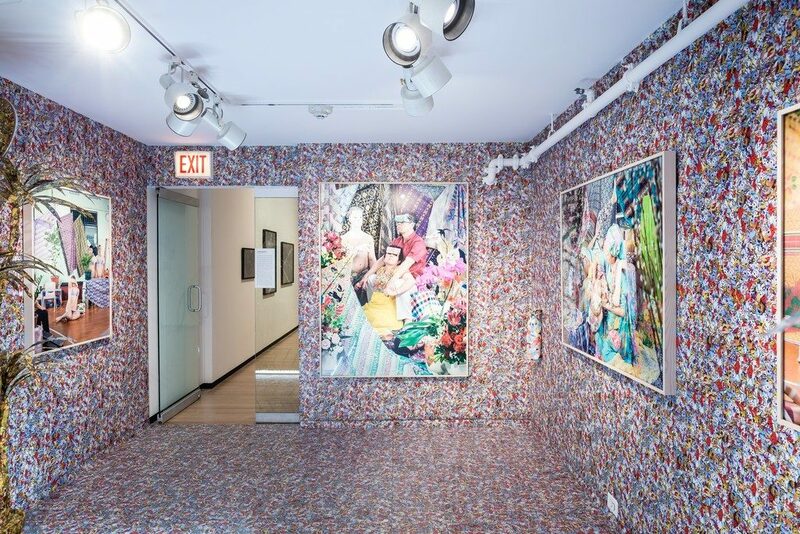 The most time-consuming room, but which gained the most attention, was Leonard Suryajaya’s installation accompanied with large colorful images. This room was made from a collage that Suryajaya made himself with one 11 x 14″ paper, at least 500 bricks (probably more for sure, I can’t remember) on the floor covered in the pattern, with his images framed and placed on the wall. It took up the whole installation, but look at it! Installation view of “Disruptive Perspectives,” Leonard Suryajaya’s installation in North Gallery. Image Courtesy of Jonathan Castillo, MFA Candidate in Photography, 2nd year. It’s safe to say that if you can work on campus doing something directly related to your field, then go for it! What better way to spend your MFA career than working with others who love what you do too?